Desert slide dryer is designed to dry the sections on the slides. Temperatures can be set between ambient and 99°C. The anodized black surface of the "Stacking Tiles" style hotplate provides high contrast with the samples. 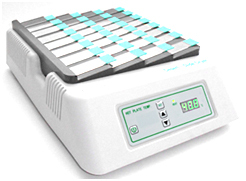 It also offers a large capacity (maximum of 44 slides at one time) for drying slides. The temperature is set with the LED digital display. It also features an auto memory for last used settings.